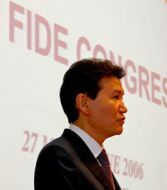 FIDE President’s first official visit to Hungary. FIDE President Kirsan Ilyumzhinov completed his two-day visit to Hungary on the evening of March 1. The concluding event was a meeting with Dr. Pal Schmitt, President of the Hungarian Republic, IOC Vice President and two time Olympic Champion. During their one and a half hour meeting, they discussed the role of chess in education and the development of young people, the new opportunities for organizing chess tournaments in Hungary, the significance of cooperation among the federations of FIDE and the expected and necessary changes in the Hungarian Chess Federation (HCF). I am delighted to welcome you to the CIS web site. Children who learn chess are, on average, more intelligent, healthier and better socially adjusted. There are also big advantages for FIDE and our national federations if many more schoolchildren learn chess. Our ultimate objective is that every child should learn to play chess. 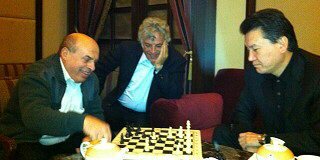 We do not need to go far along that road before chess would be recognized as the number one sport in the world. Chess in Schools is to be our main focus during this mandate and, as I promised in Khanty-Mansiysk, I have been visiting countries to promote Chess in Schools to heads of government and education ministries. I am excited about the special CIS projects. This web site will be a report card of our progress. I congratulate the Commission on launching this web site and give it my full support, exhorting the Commission to strive for great achievements. This web site will fulfil all the normal functions, such as keeping you up to date with news of relevance to Chess in Schools (News, Reports, Schedule), providing a rich resource of research and teaching materials (Information and Resource Centre). There is also an innovative section for you to submit videos that you consider to be of interest and relevance to our mission of developing Chess in Schools. Perhaps most important of all, you will be able to follow the progress of our exciting “Special Projects,” the first of which will be launched in one country later this year. Please do contact us with your comments, opinions and ideas, as well as your videos. Also I want to thank our President for his message published above. The proposal's main content concerns the CIS100 projects. What they are, why they are and what their background is. Here also are the first stirrings of FIDE Student Membership, which is beginning to take shape and bear fruit one year on. See below (click on Read More) to view the Presentation or to download the document. The cash flow projections are also presented. FIDE President discussed the implementation of chess as part of the curriculum of general schools with Dr. Shimshon Shoshani, Director General of the Israeli Ministry of Education. As a result of the meeting, Dr. Shoshani made a decision to grant the necessary funds and to prepare the necessary documents for the introduction of chess to the obligatory program of Israeli schools. It is planned to introduce chess not only to the school curriculum but to the programme of children in preschool institutions. December 2010.